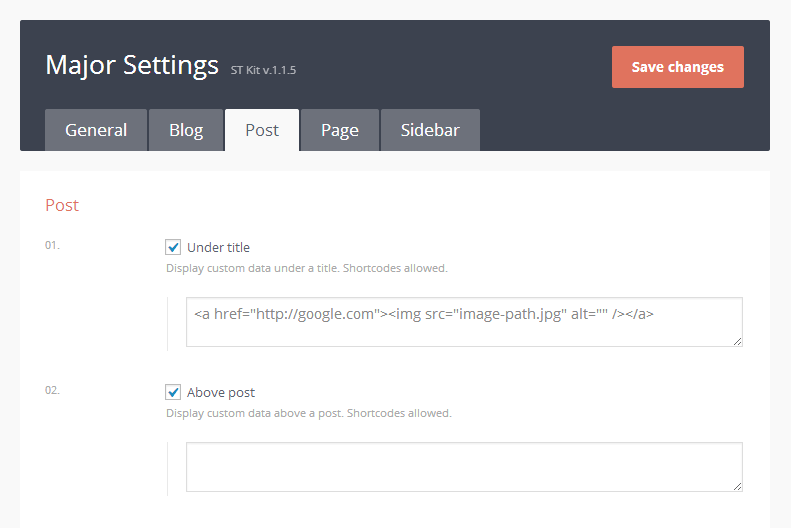 ST themes come with two kind of ad areas: ad sidebars and ad areas on post pages. Lets see hot add ads on those places. Browse Dummy folder and you’ll find a dummy ad. Copy it and go to Admin Panel > Appearance > Widgets. Browse sidebars and find one you want to use as ad holder. Drug and drop standard Text Widget on the sidebar. Paste the dummy code into the widget. Edit it in accordance with your needs e.g. set a correct path to the image (banner) and set a target URL. You can use a sample code for sidebars or your own. Open the Theme Panel > Post tab and take a look textareas: Under title, Above post, and Under post. Drop your ad code on these areas and press Save Changes button. Done!